Not much has been done on Good News lately. I have built a shelf in the rear storage area of the bus. 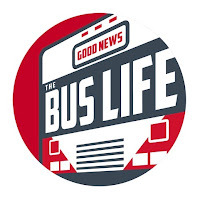 I also installed the windows seals in the front and back around the "Good News" logo. I am in the process of deciding what to do with the dash. I will either panel it or paint it. Or maybe...both. I hope to get some work done on it tomorrow.